You have to hand it to Jack Layton. He is by far, the most impressive chess master currently working in Ottawa. I never thought I'd like an NDP leader as much as Ed, and I don't - but Jack has got to be number 2. 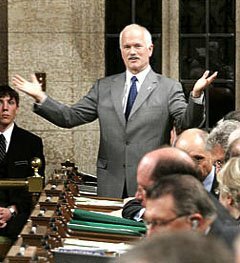 The NDP poll at 15% - 18% consistently, but it's Jack Layton that everybody is waiting on at Parliament Hill. The Liberal Party is forced into rooms to make deals with a party that cannot guarantee it's survival during a confidence vote. If you look at the math, the NDP + the Liberals is still under half. The Conservative Party and the Bloc just stomp their feet, "We want an election, we want an election." I want one too, but I want one we can win, or failing that, let's get that transit tax rebate passed before an election. But, there's Jack - attempting to negotiate a health care deal with the Liberal Party. And Jack knows, either way, he wins. Either way, Jack Layton can come out like a rose. Jack's going to let us know today what he thinks of the Liberal's response to his proposal to stop "creeping" privatized health care. All ears and eyes will be on his response. If The Jack rejects it, it means the Liberal Party doesn't stand up for public health care (they don't, but this will just be proof). If The Jack accepts it, it means Jack Layton is once again the leader of the true governing party. It's funny, isn't it? The guy with the smallest party wields the biggest stick. We got guys with 98 seats who don't wield near as much power.